So I had tickets to go see Donny and Marie for New Year's Eve. I was hoping for an evening of retro repartee between the siblings -- and to get some good GenXtinct-y nuggets to share with you guys -- but instead experienced the first bummer of 2011: Donny ended up calling in sick for the show. Although Marie did a nice job sallying forth by herself -- yoinks, can that 51-year-old "Dancing with the Stars" finalist still cut a rug -- it was still disappointing not to have the whole package -- kind of like just getting Garfunkel. Or Oates. In between numbers they showed a bunch of vintage clips that really took me back, though, from Marie on a USO tour with Bob Hope and her first appearance with Andy Williams (when she was three years old!) to both Donny and Marie with Sonny and Cher. Yep, they were cheesy and white-bread ("Donny, you turkey! "), but they just don't make 'em like those two good-natured -- and truly talented -- entertainers anymore. Just try to watch this skunk tomfoolery and not chuckle. Did you used to watch their variety show? Iwas a huge Donny & Marie fan. I had the dolls & the stage playset with cue cards & lights & camera! Donny's white loafers also fit my Bionic Woman doll. Did I watch their show??? Oh, hell YES. I even remember the one where Donny turned 21. Loved, loved, loved that show. 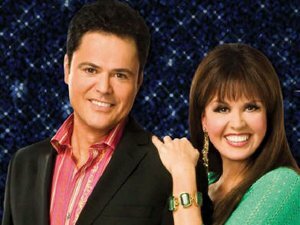 I used to watch Donny & Marie because at the time it was the only prime time show I was allowed to watch (in part because it was on Friday nights, which meant I could stay up till the witching hour of 9:00!). For all its corniness, they managed to pull off some pretty funny bits.